The rules and regulations of LTL shipping can sometimes seem overwhelming, even to the most seasoned shipper. After all, there’s much to understand to keep things running efficiently. For instance, you need to know how your product is defined by the trucking industry (referred to as the product or freight’s NMFC), how to properly prepare your shipping documentation and how the freight should be properly packaged or bundled. You’ll also want to evaluate carriers and the variety of options that are available to you for getting your freight to its final destination as quickly, reliably and cost effective as possible. When it comes to getting your products to your customer, one of the first things you need to consider is how your product is defined by the trucking industry. In the world of LTL shipping, different types of products – from steel bolts to auto parts to blenders – are defined according to their makeup. Each product definition is called a classification. The class of your freight plays a prominent role in calculating the freight charge for transporting the shipment. How are freight classes determined? The many classes of freight are catalogued in the National Motor Freight Classification tariff, commonly referred to as the NMFC. The NMFC is a publication for motor carriers containing rules, descriptions, and ratings of all commodities moving in commerce. The publication is used to classify freight for freight billing and rating purposes. Besides defining the classes of shipping commodities, the NMFC also assigns item numbers to each type of commodity. The item number is related not only to the commodity itself, but to the material from which the commodity is made, its packaging, and other factor and considerations. Item numbers are associated with rates as well as commodity classifications. What do all these different freight classes mean? 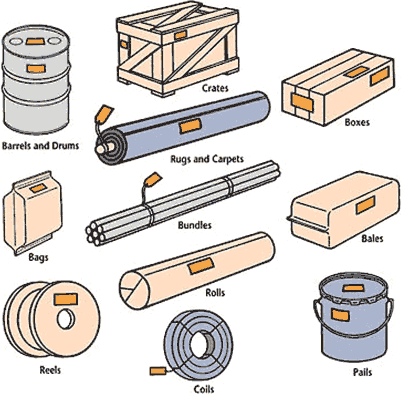 As we mentioned, several elements, including density and value, determine the freight classification of a commodity. Take ping pong balls, for example. Ping pong balls are class 500 (the most expensive freight class) because of their density, or lack thereof! A carrier can fill an entire freight trailer full of ping pong balls without having much weight loaded. Since rates are based on weight and density, the rate for transporting ping pong balls is higher than it would be for something like heavy steel parts. But even with very low-density freight, there are ways to reduce your freight rate charges. Looking at another example from the NMFC to see how you can lower your freight charges by accepting some of the risk (or limiting the value of your goods in the event of loss or damage). Perfumes in barrels or boxes may be classified under NMFC item 59070, class 85. But NMFC note 60000 states that as the shipper, you may declare a “released value” in writing on the bill of lading. In this case, the released value of the property cannot exceed $2.15 per pound. If you put this released value on the bill of lading at the time of shipment, your barrel of perfume’s class will be reduced to class 70. This means a lower shipping rate. In turn, the carrier has limited its liability to $2.15 per pound should damage or loss happen to the shipment. Therefore, stating the released value of your goods on the bill of lading and accepting the associated protection tradeoffs can adjust your classification and lower your rates. The last four elements (among other criteria) go into establishing the classification of a commodity. The NMFC, or National Motor Freight Classification tariif, contains all product classifications. There are eighteen possible classes ranging from 50 to 500. The higher the class, the higher the rate for every hundred pounds you ship. Most less-than-truckload rates are stated as a rate per hundred pounds, or per hundredweight. Rates are structured so that as the weight of your shipment increases, the rate per hundred pounds decreases. For example: a shipment weighing 100 pounds may cost $41.00 per hundredweight, while a heavier shipment–say, 500 pounds–of the same commodity (moving to the same final destination) may only cost $35.00 per hundredweight. But doing the math, we see that the total charges for the 500 pound shipment are higher (5x$35 is greater than 1x$41). Most LTL carriers state a minimum charge for very light shipments. This sample rate matrix shows how a carrier’s rate table might look for rates between two zip codes. Weight breaks are indicated across the top. The freight classes are listed down the left side. Note in the sample freight matrix how the freight rates increase as the class goes up. Also note how the freight rates decrease as the weight break increases. There is a similar freight rate table for every origin/designation zip code combination serviced by a LTL carrier. Complete a bill of ladingThe bill of lading is a legal contract between the shipper or a 3rd Party Logistics Provider (3PL) and the carrier. It should state exactly what is being shipped, where it’s coming from and where it’s going to, etc. If using a 3PL, they will usually provide a system generated BOL for the shipper to use for the freight shipment. Select a carrierSelection criteria are often based on the commodity you are shipping, the services the carrier can provide, where your shipment is going, the date by which the shipment should arrive, and the cost of these services. You must evaluate the options based on your company’s freight shipping needs. Place the orderDepending on the time of your order, most carriers can have a truck at your location that same day or usually the following day at the latest. The carrier or 3PL provider will probably ask where the shipment is going, how much it weighs, if it is ready to be picked up, how late the shipment can be picked up, and who is paying the charges. Hint: Place the order early in the day to increase your chances of a same day pickup. Proper packaging is a must. Don’t ship your goods without proper packaging and protection. Many claims and freight damage arise from improper packaging — and packaging errors may eliminate the carrier’s liability. The sample pictures below should help you visualize how to best package and secure your goods. 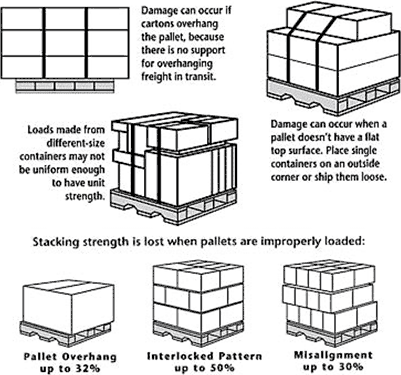 When possible, heavy, bulky items should be placed on pallets for improved handling and care. To maximize carton strength, stack cartons on the pallet vertically. You can secure cartons to a pallet with banding, shrink-wrap, stretch-wrap, or breakaway adhesive. Cartons should be stacked squarely on the skid, with no overhang. Box flaps and corrugations should face up. It’s best that the top surface is flat. Shipping labels must be placed on every piece of your shipment. The shipper and consignee information must match the bill of lading information exactly and your labels must be legible and complete. Ideally, you should place labels securely on both the long and short sides of each piece. DOT hazardous material labels are required when shipping hazardous materials as specified by the DOT. Address markings should be located as shown in the examples below. The location shown indicates the top, a side, or an end. If more than one location is shown, you may choose which one to use. An invoice for the shipment will be sent to the appropriate party soon after pickup or delivery has been made, depending on whether the shipment is prepaid or collect. Questions regarding the amounts shown on the bill should be directed to your carrier or 3PL provider. If you feel you have paid too much, contact your carrier and ask to file an overcharge claim. Note that carriers do charge for incorrect weights and classification of goods. Therefore it’s very important to state the correct weight and freight class when rating and shipping via LTL carrier in order to eliminate rate changes due to incorrect information. If a shipment is either short or damaged, you should still accept the delivery but make clear notes of the short or damages on the delivery receipt. Make sure you receive a copy noting the short or damages. It’s the duty of the shipper and the consignee to mitigate the loss with the LTL carrier’s involvement. After you accept the shipment, take steps to protect the shipment from further loss and file a claim for the actual shortages or damages involved promptly. Listing of CAT Truck Scales in the Unites States and Canada.